Several bullets pierced through an Annapolis apartment building early Tuesday morning hitting several windows, a door, and cars in the area. ANNAPOLIS, Md. 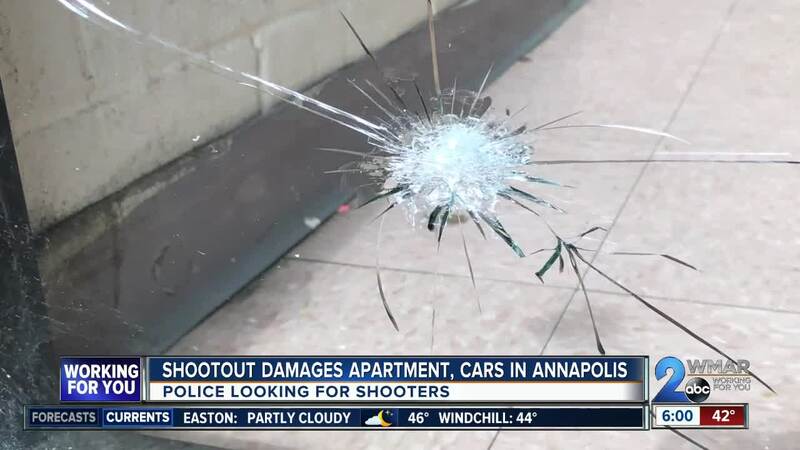 (WMAR) — Several bullets pierced through an Annapolis apartment building early Tuesday morning hitting several windows, a door, and cars in the area. On Wednesday morning, the Harbour House apartment complex was filled with parents bustling their little ones to school or other activities for the day. A little more than 24 hours earlier, it was the stage for a makeshift gun range. Buildings, cars, and a front door were all riddled with bullet holes after a shootout at about 1:42 a.m., according to Annapolis Police. "There were two unoccupied vehicles that were struck by bullets as well as an apartment building and the front entrance door into the main hallway and two occupied apartment windows were also struck by bullets," Sgt. Amy Miguez, a spokeswoman for the police department, said. She says police are unsure what happened in the moments leading up to the shooting. An officer on patrol heard the gunfire, however by the time they got to Madison Street, the scene was clear. There's surveillance cameras attached to each of the buildings. Officers are hoping with a little luck, they'll at least be able to make out who pulled the trigger. "We don't think that anything that was struck was targeted during the shooting, but it's really concerning for us that there are people out there shooting and the bullets are striking random areas," Miguez said. In December, police dealt with a similar case where two cars were hit by random gunfire. It happened about ten minutes from Tuesday's shooting. "It's really important that people tell us what they know. If people are carrying guns illegally, let us know. Give us a tip, you don't have to give your name. It's going to make the community a lot safer," Miguez said. Especially for the kids, who live feet from the bullet holes in the busy complex. If you know any information about this case, you're asked to call Metro Crimestoppers at 1-866-7-LOCKUP.